Over the years, it has been Sergio Garcia's passion for the game — his revelry in success and despondency in defeat — that has endeared him to some fans, while repelling others. Though his 2017 Masters victory seemed to fill a void in Garcia's career resume, it didn't scrub the fire from his game altogether. Now, scrutiny on his conduct has hit new levels after a bunker meltdown and controversial DQ in Saudi Arabia over the weekend. We'll see Sergio at next week's Genesis Open, where he's sure to face a number of questions about his conduct in Saudi Arabia. In the meantime, here's everything we know about his week at the Saudi International. 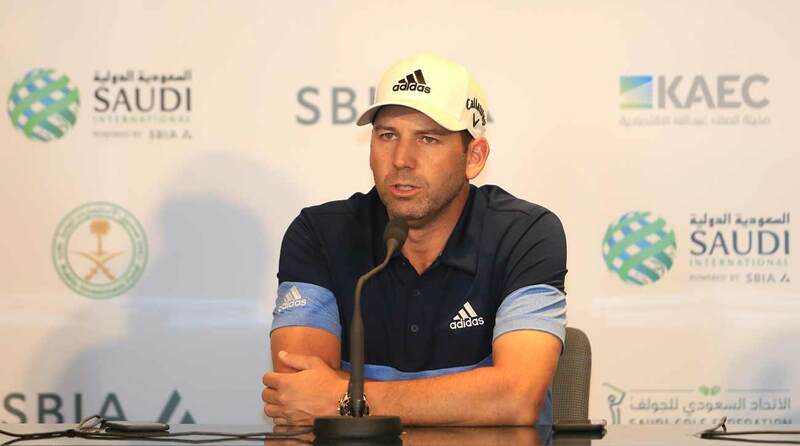 Sergio arrived in Saudi Arabia on a strong run of recent form; he was fresh off a T3 at the Dubai Desert Classic and had notched six consecutive top 10s on the European Tour. He joined the rest of the field's high-profile players (Dustin Johnson, Brooks Koepka, Thomas Bjorn, Lee Westwood, Ian Poulter, Thorbjorn Oleson, Patrick Reed, Bryson DeChambeau, Justin Rose and Henrik Stenson) in a promotional photoshoot "putting Saudi Arabia on the map." Sergio Garcia was among those high-profile Tour players in the Saudi International's preview photoshoot. Then Garcia took questions at a press conference after arriving in King Abdullah Economic City. On questions touching on Saudi Arabia's dubious human rights record, he largely stuck to the same "grow the game" script of his fellow competitors. But he was also asked about the course and about the way the European Tour handles rules, which led to some answers that would prove both prophetic and ironic by week's end. A selection: On his first impressions of Royal Greens Golf and Country Club: "It looks beautiful. It looks really, really nice. I'm excited to go out there later on and play nine holes and get a feel for the course a little bit. See how it's playing. You know, saw a couple of holes here and there and they looked really nice. On Haotong Li's penalty in Dubai: "It is what it is. The Rules of Golf are there for everyone, and it doesn't matter, you know, or it shouldn't matter who breaks them, even though they weren't trying or anything like that. Everybody has got their books and they showed all the new rules and the things that you can and cannot do." On European Tour CEO Keith Pelley's handling of the Haotong Li situation: "Yeah, I mean, it is always nice for Keith to look after us. But at the same time, you know, you've got to be careful because if you start making exceptions here and there, then where do you stop. "So at the end of the day, when it comes down to the rules, we are responsible, we and the officials and we have to take care of it. If you make a mistake, you get penalized and that's it. I've always said it; I'd rather get penalized if I've done something wrong than get away with it and know that I've done wrong." Sergio Garcia took questions during a Tuesday press conference in advance of the Saudi International. Garcia played fairly well Thursday, posting an opening one-under 69. During the round, he drew a tough break when a cell phone rang in the middle of his backswing, leading to an all-time exasperated look. https://twitter.com/Sean_Zak/status/1091703746780909568 Garcia's playing partner, Matt Wallace, clarified that the cameraman's assistant was the offender. This was the cameraman’s assistant also ?? While his playing partner, Dustin Johnson, was in the midst of shooting a course record nine-under 61, Garcia was plugging along, two-under for his round and fresh off back-to-back birdies, when he arrived at the par-5 fourth hole. Garcia found the front greenside bunker in two but drew a poor lie and failed to get his first attempt out, as shown by SkySports. After his second attempt from the sand, Sergio went berserk on the bunker. With playing partners Matt Wallace and Dustin Johnson looking on, Garcia took his wedge to the sand, tomahawking the surface four times in quick succession before uttering a string of curse words in Spanish on his way up to the green. Once it was released, the video quickly went viral. Check it out below: https://twitter.com/dylan_dethier/status/1092585956723576834 Garcia went on to shoot even-par 70 and make the cut. But then things really got weird. SATURDAY, FEB. 2 Before golf fans in the U.S. had even woken up, word started coming out of the Saudi International that Garcia had been disqualified for "serious misconduct." After posting a score of one-over 71, Garcia was informed of his DQ. Early reports suggested that the misconduct involved intentionally damaging the greens, both with his spikes and with his putter. Because Garcia had teed off so early, SkySports cameras weren't out to capture the behavior (though that claim didn't do much to stop some conspiracy theorists), but Scotsman reporter Martin Dempster, who was on the beat all week, provided further detail. Garcia had allegedly damaged five greens, which had come to officials' attention when players in subsequent pairings began to complain. https://twitter.com/DempsterMartin/status/1091704663152517121 Garcia accepted the DQ and released a statement through the European Tour. "In frustration, I damaged a couple of greens, for which I apologize for, and I have informed my fellow players it will never happen again." That night, Garcia attended a yacht party in the nearby marina hosted by Yasir Othman Al-Rumayyan, chairman of the Saudi Golf Federation, before flying out to Switzerland, according to the Scotsman. According to the commitment sheet and to his own website, Garcia will tee it up again at the Genesis Open next week. The star-studded field includes Tiger Woods, Dustin Johnson, Rory McIlroy, Justin Thomas, Bryson DeChambeau and plenty more top players. It will be Garcia's first PGA Tour appearance since the Wyndham Championship last August. There's no doubt that Garcia will face questions about his conduct; even if he doesn't have a press conference at Riviera, there will be swarms of reporters looking for his comment on the incident. Golf fans everywhere will be looking for the answer to one question in particular: What happened?